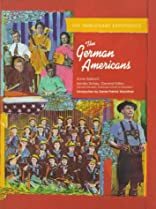 Discusses the history, culture, and religion of the Germans, factors encouraging their emigration, and their acceptance as an ethnic group in North America. About Anne Galicich (Author) : Anne Galicich is a published author of children's books and young adult books. Some of the published credits of Anne Galicich include The German Americans (Peoples of North America).